so… we have a little dust being kicked up around these parts. before you think i’ve absolutely gone off the deep end for scheduling a home in upheaval during the busiest part of a stationer’s year, i’ll tell you that you’re right – but it’s also kind of perfect, too. i don’t have time to cook anyway, so it’s not like my kitchen is getting any kind of workout in oct/nov/dec. plus, i’m here all day working so it makes it easy to let workmen in and answer questions they have along the way. during holiday card season, i honestly don’t have time / am too exhausted to pick up the house and make it look presentable, so some cardboard taped down on the floor along with some construction dust is nothing. if you want to feel better about the state of your house, come on over! flash back to january 2011. we had been living in my 1 and 1/2 bedroom condo (i say 1/2 because sweet rush’s nursery was in a sunroom…with lots of blackout curtains). we had been casually house hunting and put a few offers in, but nothing had worked out. we found out we were expecting another baby and thus, had to move IMMEDIATELY if not sooner. we scheduled a full saturday and sunday of intense house searches with our agent the following weekend, and were determined to make something work. i should also preface this with the fact that rbb and i are what you would call finicky homebuyers. 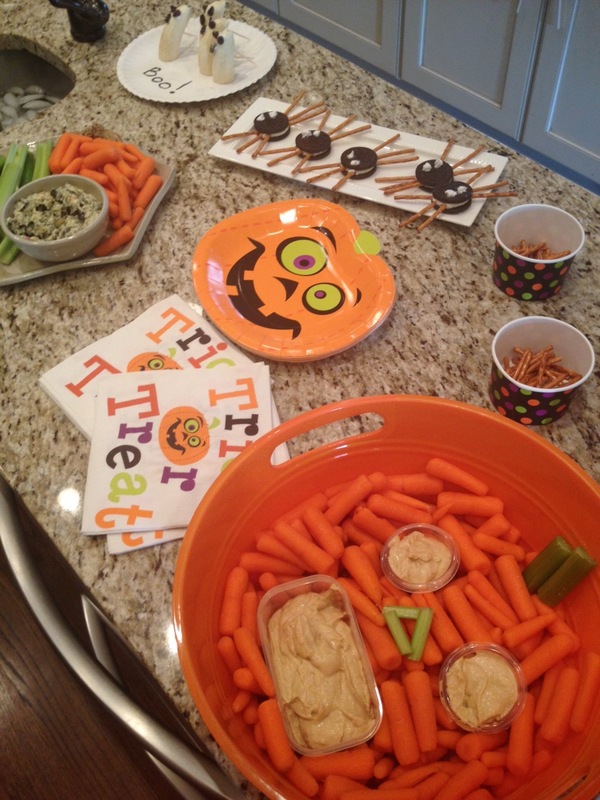 we don’t want something that is turnkey…where’s the fun in that? we wanted to be able to put our own mark on something, and get a little renovation experience under our belts. but not TOO much – we couldn’t handle a full gut job or anything – and remember we had a baby on the way so the whole thing was time sensitive. we needed to find something that was just right. not too nice, not too dumpy. 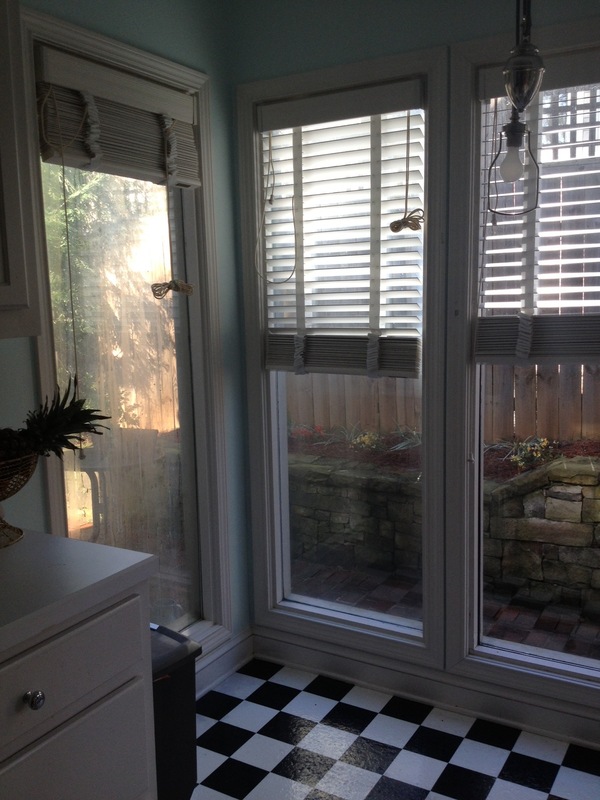 something that we could live in without having to renovate right off the bat, but that also needed a little love. this lead to us looking at a bevy of total POSes. houses that had been sooo badly and cheaply renovated, estate properties that hadn’t been tended to properly in at least a couple of decades, and foreclosures that had everything down to the faucets ripped out. our agent set up a dozen or so homes that we had chosen, all across town in different neighborhoods and school districts, and the house that we ended up buying was the very first that we looked at that weekend. we were in love from the first minute we walked in. it weirdly felt like our house. it had the charm of an old house, somewhat updated bathrooms and kitchen (meaning: they only minorly sucked, and we could live as is for awhile), was on a fabulous street and was in our preferred school district. and being a foreclosure and not having been lived in for a good 9-10 months, it definitely needed some love in more areas than one. after a little bit of craziness that comes with buying a foreclosure, we closed at the end of march 2011 and promptly moved right in. and here we are…two and 1/2 years later. we’ve put countless coats of paint (we….i mean rbb of course) throughout the interior, hung curtains, replaced carpet, etc., etc. 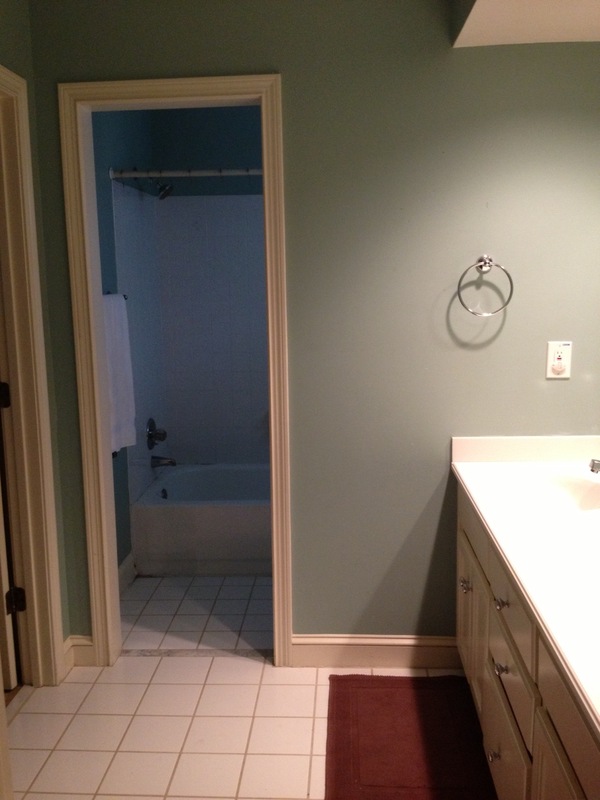 but the master bath and kitchen remained largely untouched, because we were waiting to overhaul them. here is where we started – i’ll begin with the master bath. in short – it’s totally 80s. 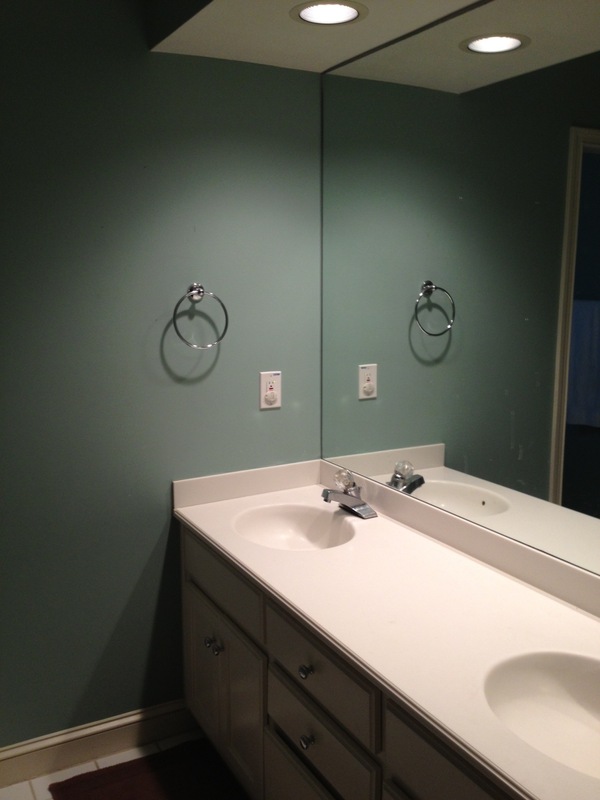 we’re rocking crystal knobs, one of those frameless mirrors, crappy lighting, low low low countertops and for good measure, wallpaper covered with blue latex paint. awesome. 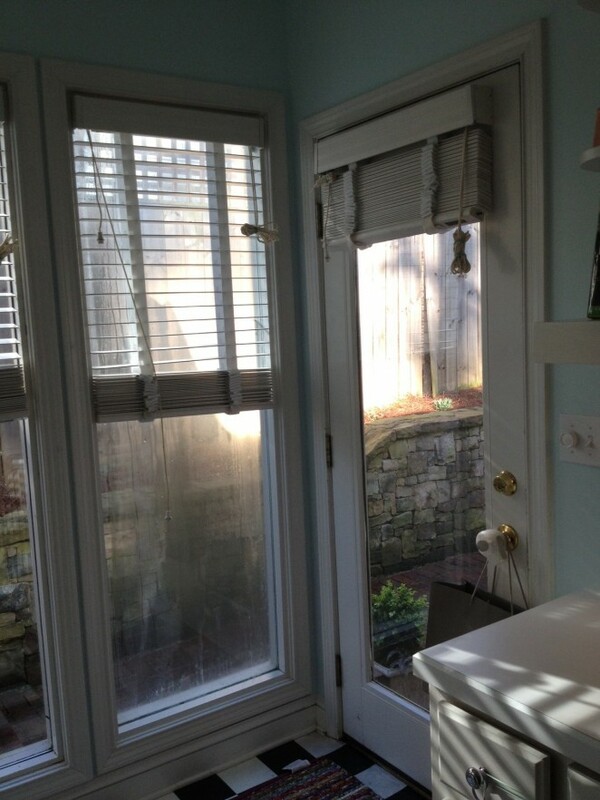 and looking into the water closet/shower. you can see some side effects of that fabulous paint-over-wallpaper situation going on in the corner. 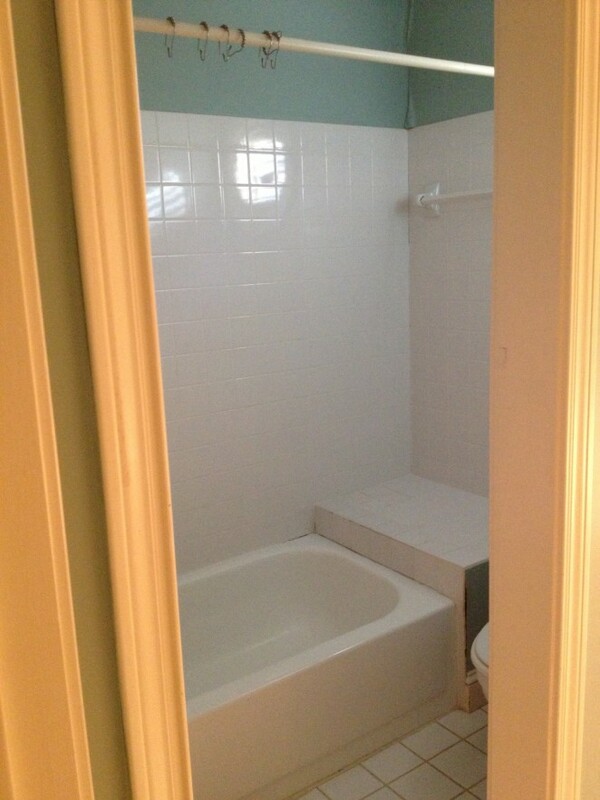 one of my biggest bones to pick with this bathroom – NO DOOR TO THE WATER CLOSET. just wide open right there. SO no bueno. we are totes remedying that with a pocket door. so now the kitchen. 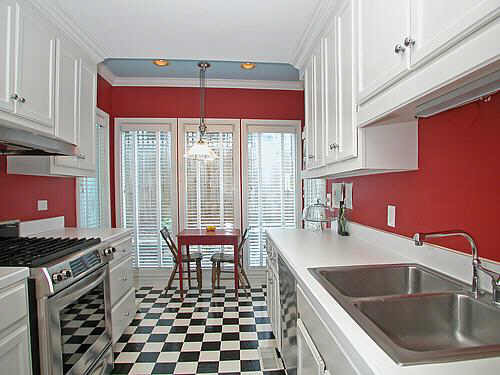 when we first moved in, the kitchen was this horrible, horrible red. like a blood red. i know i say all the time i love color, but i am just not much of a red person beyond lipstick and pants. that’s about all i’ll ever have that’s red. see? 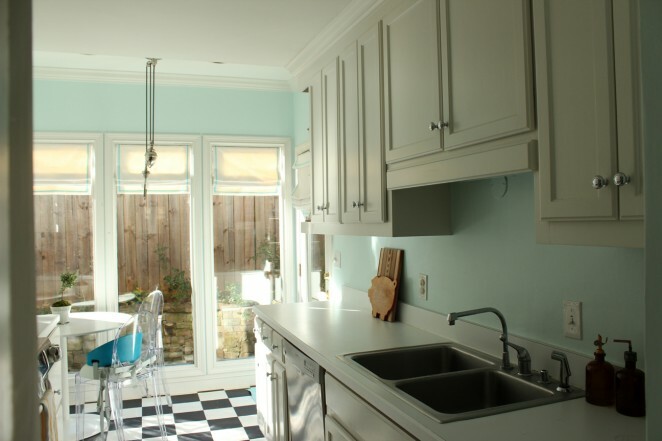 not terrible, just not the best kitchen you’ve ever seen – but works fine. 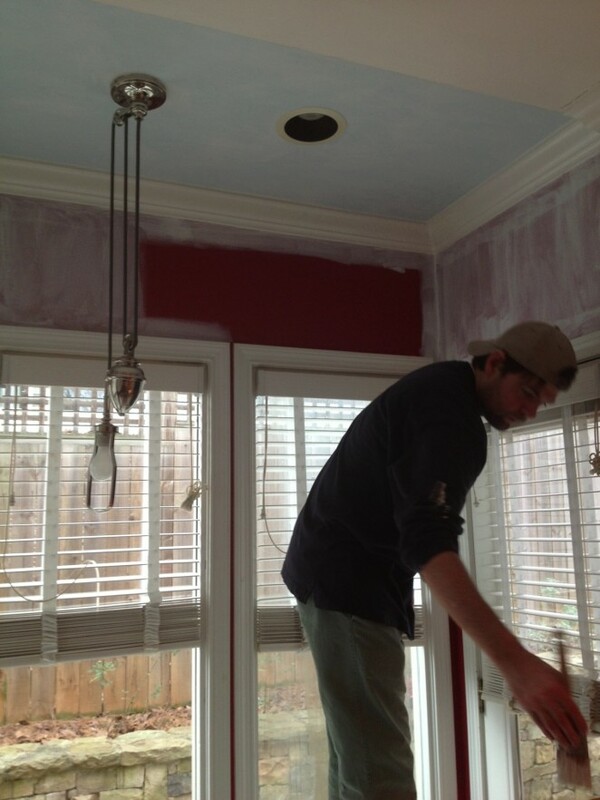 – new paint (duh) – a light, light aqua on the walls and white on the ceiling. p.s. i have a major crush on the painter. – new linoleum – looking back, we shouldn’t have bothered…but the old stuff was peeling up and secured by DUCT TAPE in some places. duct tape, people. 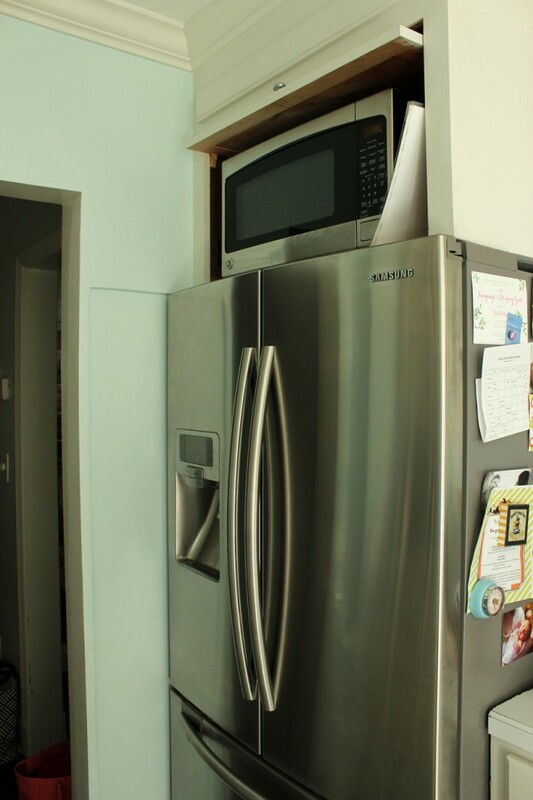 – a little drywall work on the wall by the entry so the left fridge door would open. 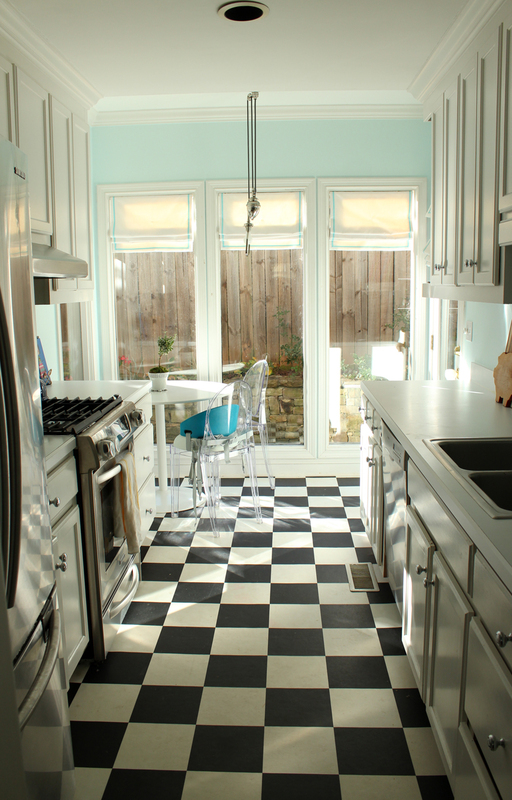 this kitchen is kind of like a monet (clueless – still such a great movie). 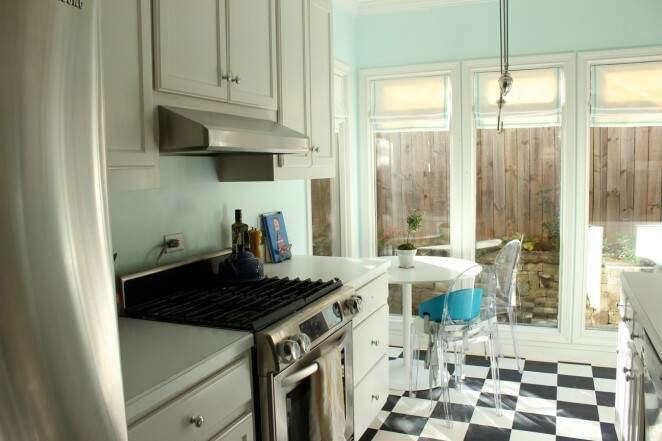 from far away it looks alright, but if you get up close, you see the cheap flooring, peeling up laminate countertops, cabinets that are past their prime, old old sink and unfunctional uses of (little) space. 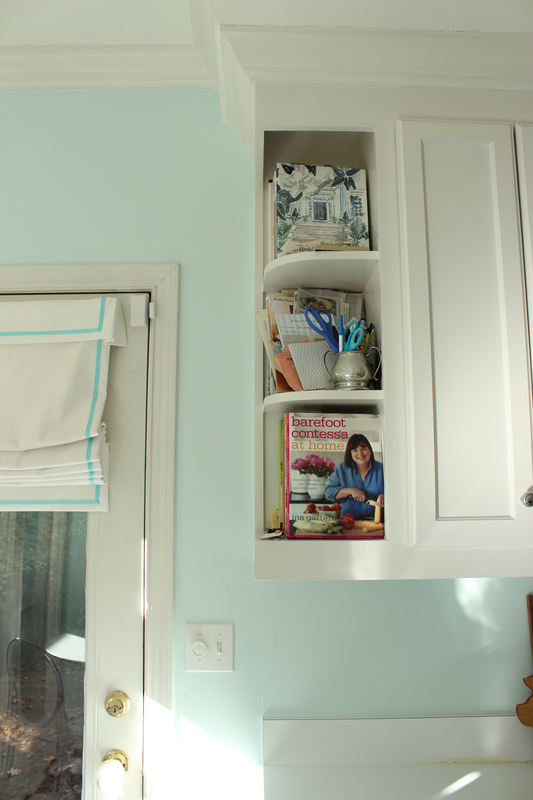 i loved this little cookbook nook right when i saw it. sadly, we are changing it out for extra cabinet space… and who am i kidding, i never kept it tidy enough to look good anyway (see middle shelf with burgeoning coupons, notepads and clipped recipes). file under “what in tarnation…” who would put a microwave over a fridge?! i could never see what was in it, even standing on my tippy toes. we were happy with this kitchen, but also knew that we would need to fix it up to sell it – which we aren’t planning to do anytime soon, but we still want to be able to enjoy the fruits of our labor before we move on. so we decided to just go for it – eek!! so now comes phase II for the kitchen and phase “out with the old, in with the new” for the master bath, in which every little thing that you see in the photos above, and then some, was pulled out. stay tuned for WEEK 1 of the renovation diaries!! i have been so excited to share that my “cheers!” tags are featured in the november/december 2013 issue of simply buckhead! 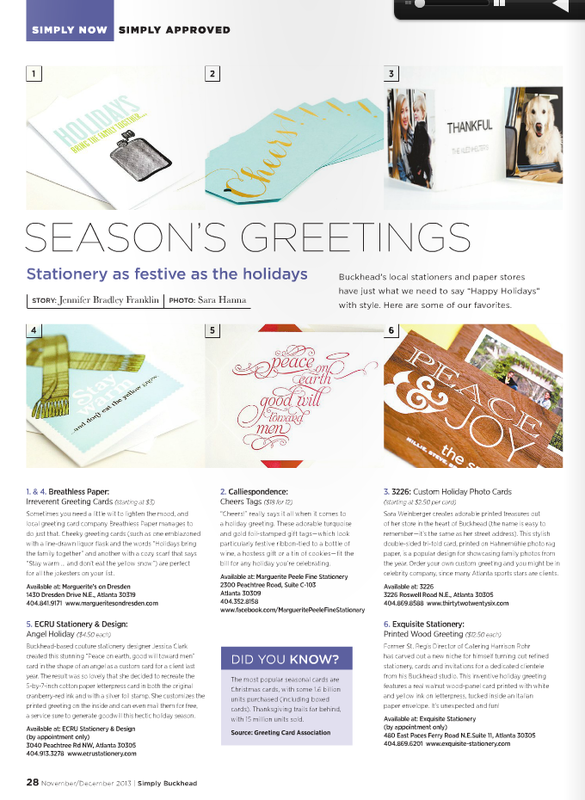 i’m honored to be included in their “simply approved” section focusing on holiday stationery items. turquoise has been the clear fan favorite. i am almost completely out of them and will be getting another run of them (along with some new colors) printed this week! 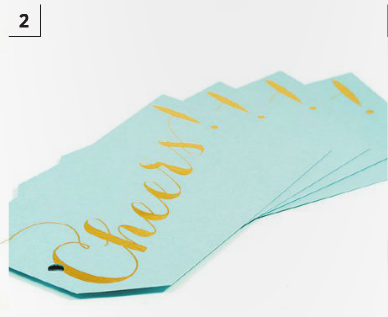 if you’re an atlanta local, don’t forget you can also pick up the gold foil cheers! 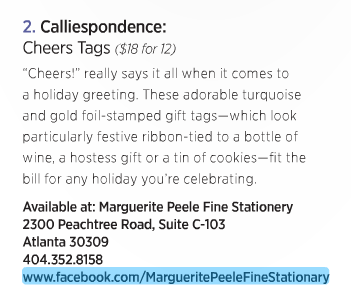 tags at marguerite peele fine stationery in the peachtree battle area! you can always order via email (callie@calliespondence.com) or the etsy shop as well. 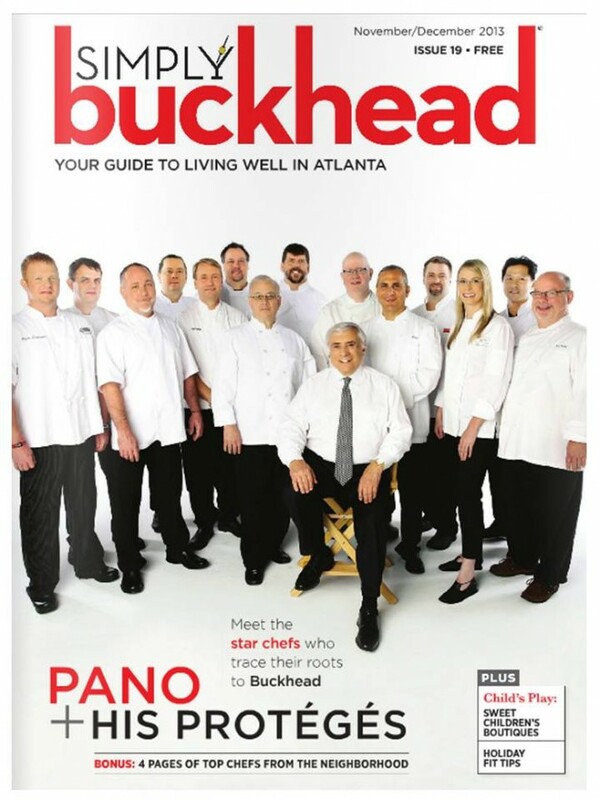 thanks to allison (editor), jennifer (writer) and sara (photographer) at simply buckhead for thinking of calliespondence for your holiday issue!! 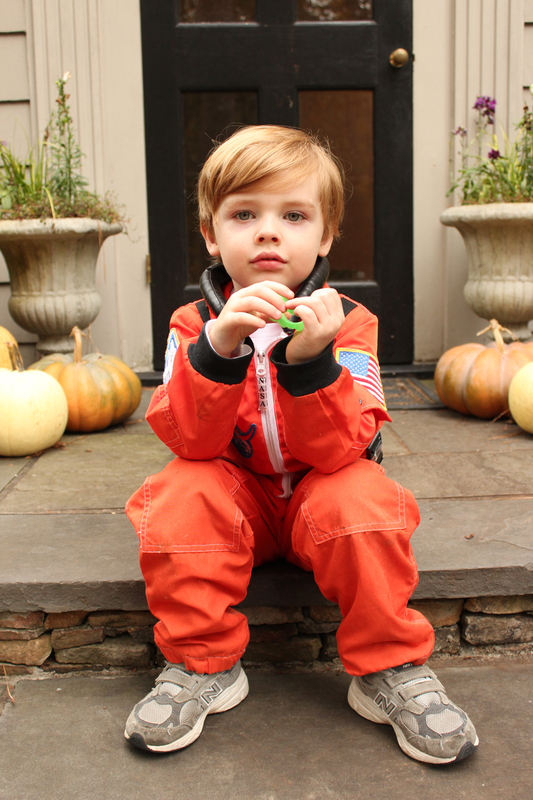 can i still say happy halloween? 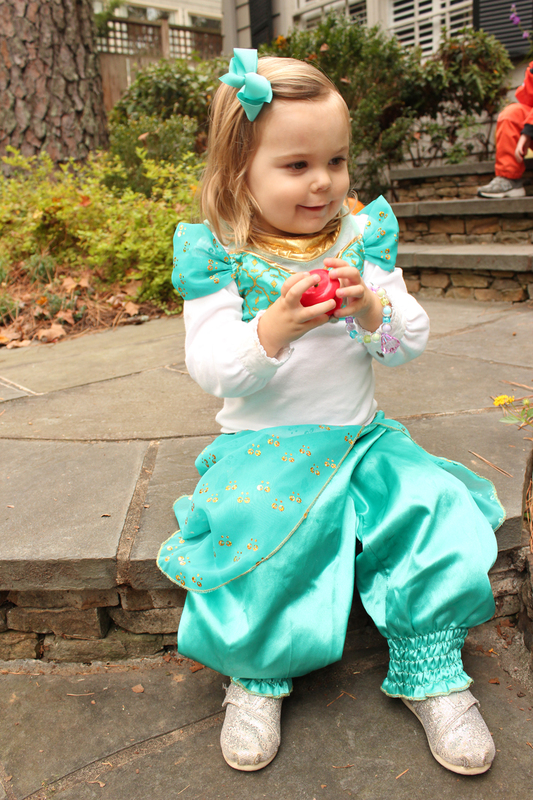 we had a great time hanging out with princess jasmine and an astronaut on 10/31. they got lots of mileage out of their costumes with wearing them at school, a children’s museum party, a party my in-laws took them to, and a spooky playdate. i thank heavens i have cute friends who do things like spooky playdates, because i sure as heck ain’t going to. adorable, right? she even had a craft for the kids to do! i feel like i’m doing really good if i find a pair of matching socks. it was precious and the kids just loved it! 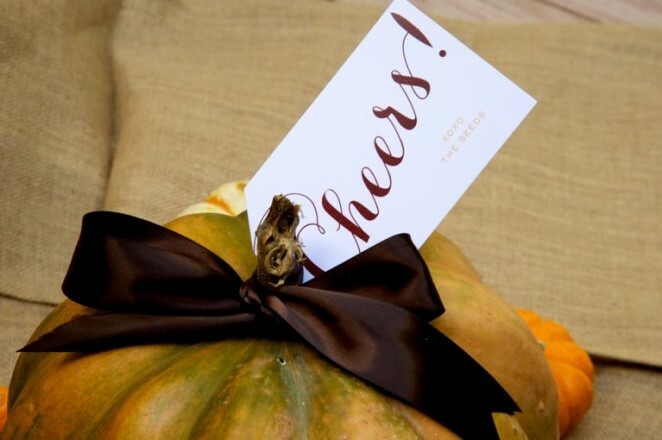 one of my super cute clients asked me to whip up some fall-themed “cheers!” tags that she could tie to pumpkins to deliver to friends. first of all – what a fabulous and creative idea for a gift! 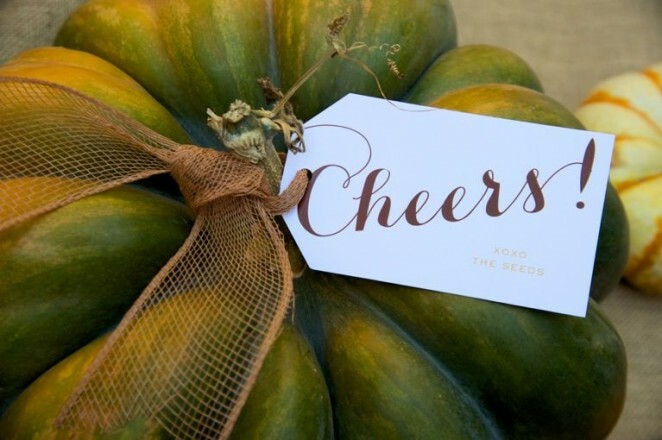 who wouldn’t love a pretty pumpkin for their doorstep in october?! just love how the whole package looked – perfectly festive! this is not really october-y, but happened in october… rbb and i casually mentioned getting a new faucet for our hall bathroom. the one that was in there was just kind of cheap and started acting like it. i happened to be at home depot and passed a clearance end cap with a bunch of stuff…and i can never pass a clearance rack of any sort and not have my eyeballs zero in on it. 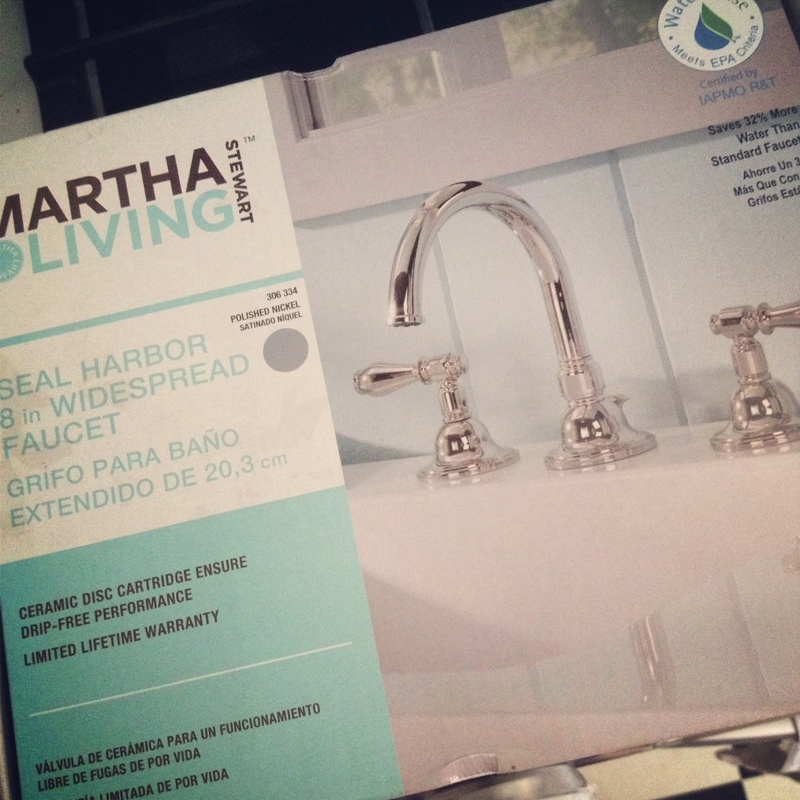 i saw a pretty martha stewart faucet with no price tag. there was only one of this kind, but the others around it were all marked down in the neighborhood of $60-$80. i took it up to the cash register to get them to price check it…they scanned it and it rang up for $0.01. well, obviously that can’t be right. the cashier called a manager over to look at it – the manager looked at me and said, “i’m sorry ma’am, we are required to sell you this item at what it rang up for.” i’m sorry?! lady, you just made my DAY! lest the universe think you’re ahead in life for more than 5 minutes, rush spilled iced coffee all over my keyboard the next day. so i thought the universe and i were even, and went on my merry way after a quick visit to the apple store. a few days later, rbb set forth to install the new faucet (those tech guys – they’re handy ones) and after toiling over it all day, he found that the pedestal sink had cracked and thought it might topple over at any minute. 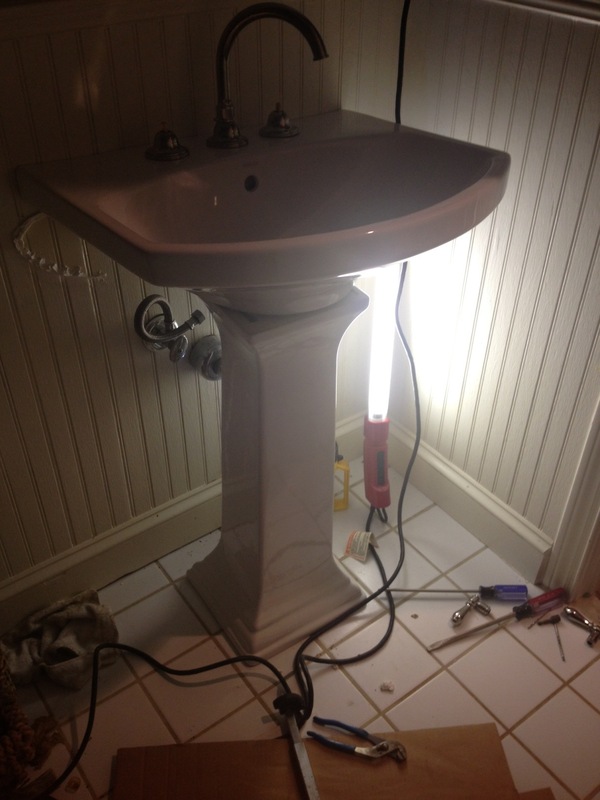 cue to immediate ordering of a new pedestal sink from home depot. universe, you got me on this one. we had a plumber come over to install the new sink with the faucet and i just had to laugh when he asked if it was supposed to look like this. um….no. 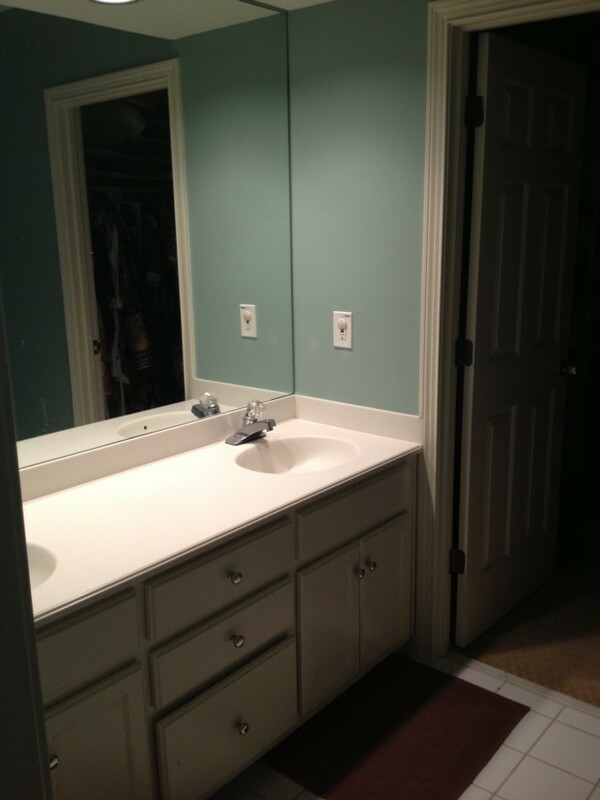 that would be a basin and a pedestal from two totally different sinks. most expensive, annoying penny faucet EVER. lots has happened since around these parts, but i will have to save that for a post next week. think: demo crews, studs and all kinds of workmen traipsing around. back with more when i crawl out from under the construction dust and holiday cards! !